There are a few things to think about when choosing a golf bag. When you go shopping for a bag, you will probably notice that there are different types available. If no one has ever explained to you what these differences are, you may find yourself confused as to which type you should purchase. The foremost thing you need to think about when bag shopping is how many clubs you want to carry with you on the course and how you would like to do the carrying. This will determine the kind of bag you need. If you are carrying your bag, consider the weight. 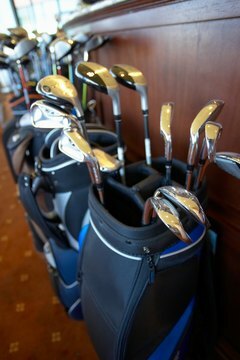 Strongly consider buying a carry bag if you plan to lug the clubs yourself. These bags are designed to be lightweight to reduce the strain on your back as you walk the course. They are usually made of plastic or nylon, instead of heavy materials like leather. These bags hold a basic set of clubs, as well as your tees and balls. Think of them as the cargo pants of golf bags. There is a place for everything you need on your person, but add too much and you will be weighed down. Often they have backpack-like straps so you can pick them up quickly and be on your way. Some have stands so you can sit them upright to remove your clubs. If you are using a caddie, consider a staff bag. 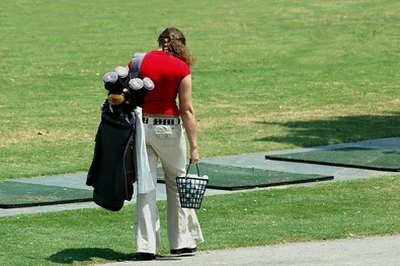 Buy a staff bag only if you will have a caddy at your disposal the entire time you are golfing. These bags are quite large, at about 8 to 12 inches in diameter, and can be heavy. They are designed to hold an entire set of 14 golf clubs as well as all the accessories a golfer could possibly need. Often these bags are leather and have a prominently featured logo on the side. 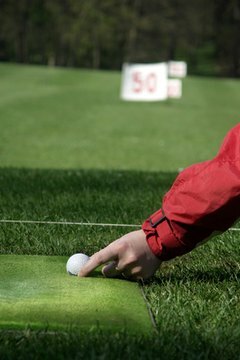 Most professional golfers use them, and they have a price that reflects this. They are also referred to as tour bags. If you generally use a cart, try a cart bag. 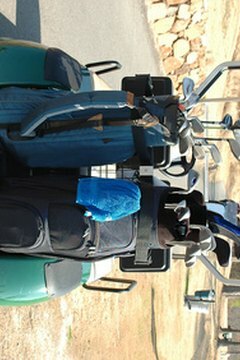 Consider a cart bag if you plan on golfing at a course where golf carts are required or where you will have one to use. These bags are mid-weight--lighter than staff bags but heavier than carry bags--and are not designed for ease of lifting. Most are between 5 and 9 inches in diameter. They have more storage areas than the typical carry bag and are designed for optimal organization. They allow you to set the bag on the cart and leisurely sort through them. They can be made from a variety of lightweight or heavier materials, depending on the manufacturer.